Multiple media outlets are reporting that Mets fan Antonio Nararainsami, 36, lost his footing last night after the game at Shea and fell to his death from an escalator. He lived in Brooklyn and was originally from Guyana. He was reportedly wearing a Mets cap when he fell. Reports say that Nararainsami worked in the HVAC business, loved sports, and was the captain of a local cricket club. The Mets Report and Mets fans everywhere are thinking about the Nararainsami family and their loss. Antonio was at the game with his two daughters and several relatives. 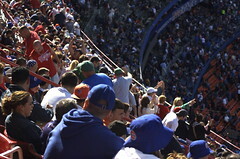 The last home opener at Shea Stadium in pictures. Thanks for the pictures Dad. As we embark upon the last season of New York Mets games at William A. Shea Municipal Stadium, the mainstream media is filled with fond remembrances of concerts, games, and the like that occurred inside those rounded walls. It’s starting to be tedious but I surmise that I’ll be able to suffer through it. As a matter of fact, I respect the opinion of those that harbor good memories of family, friends and good times had there. I too have fond memories of games and concerts at Shea. As the sun begins to set on Shea, I wanted to get my feelings on paper (in code, I mean). I’m wondering if my feelings will change between now and the end of the season when the reality starts to hit that I won’t be going back there anymore. Right now, I don’t think that I’ll be bidding on an orange field level seat or a chunk of sod when the Mets and the City of New York start taking the stadium down, piece by piece, and selling it off. I won’t miss Shea one bit. I think that my feelings come from an inner belief that the future will be better than today. That belief, transferred to the Mets baseball franchise, leads me to think that my time at Citi Field will be better than times at Shea. I’m an optimist. The games, concerts, and other events that I attend there will be better than the ones that I enjoyed before. Heck, I don’t even mind that the Mets sold the name of the stadium to a corporate entity. If it helps generate revenue for the Mets, I don’t even mind if it’s called “Blackwater Field” or “Arthur Anderson Stadium”. What’s in a name anyway? The top of my list is the first game after Sept. 11, 2001. I was watching on TV on Sept. 21, 2007 when baseball brought a small sense of normalcy back to us even though we knew things would never be the same. I’ll never forget that game. My first major league baseball game was at Shea in 1984 with my friends from high school. I had been to minor league games before that but my first major league game was at Shea. The major league experience has had a profound impact on my life. My first World Series game was game 1 of the 1986 series. I went with my dad and we got tickets outside the stadium before the game. Awesome experience, there’s nothing like being at a World Series game. The October 1989 Rolling Stones Steel Wheels Tour. That was a massive show by real rock stars. I’m too young to remember the ’69 and ’73 teams, as well as the Beatles in ’65. Although I’ve heard a lot about those teams and read quite a bit as well, I wasn’t there to see them. But as you can see there are some important and impactful experiences I’ve had that involve Shea. Even still, I’m of the belief that games and events at Citi Field will be terrific. If you read this blog regularly you know that I was in Miami last week for the Mets opening day game against the Florida Marlins. Dolphin Stadium is a venue that the Marlins have been trying to get out of for years. And it’s much nicer than Shea! Shea doesn’t have character like the old classic parks Wrigley and Fenway. Those stadiums should exist until they start crumbling under the fans feet. They’re that good. Shea is a cookie-cutter, multi-purpose monstrosity. There’s basically no redeeming value in modern baseball for William A. Shea Municipal Stadium. There are newer stadiums around the league that are designed for baseball only in San Francisco, Pittsburgh, Washington, San Diego, Texas, St. Louis, and even Baltimore (although not “new” anymore). Why shouldn’t Mets fans enjoy one of the best stadiums in baseball? The Nationals/Expos have never won anything and they have a great new stadium. Sure, they moved to a new city to get it, but it’s a new stadium nonetheless. I thought that writing this might generate some negative sentiment. That’s not my intention. I’m simply stating that the new stadium will be much, much better than what we have now. I’m more focused on that than I am on any sentiment for days gone by in Flushing. I started searching for any recent baseball stadium reviews. I couldn’t find many, but ESPN and Sports Illustrated have done some stories over the past few years on the topic. 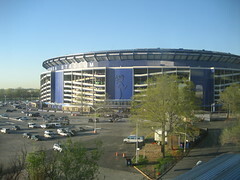 Each had Shea listed at, or near, the bottom of the list of existing stadiums at the time. I have to agree with those assessments wholeheartedly. We have the worst stadium in the sport. That hurts. We’re the best fans and we deserve better. I may change my tune when September 28, 2008 starts to near. The last regular season game on a Sunday afternoon in Flushing may bring more emotion than it does now. Hopefully, Shea will get to see several more post-season series’. The last game may be in the World Series! That would be a fitting way to say goodbye to this old, outdated architectural blight. 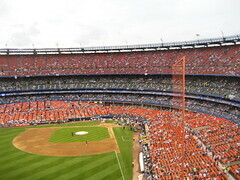 Author Dave DoylePosted on April 7, 2008 Categories Shea StadiumTags baseball, City of New York, Shea StadiumLeave a comment on Good Riddance To Shea! I’ve been tinkering with the design of this site for the last month or so. I’ve found some designs from WordPress that I liked, but not quite that much. I finally came across this great design from Chris Pearson at Pearsonified. The guy writes an interesting blog and has some great WordPress themes like the one that I’m using on this site. Check out his site. Ben’s a good guy and a really talented photographer, as you can see from his great photos of Shea here. Check out his site for some awesome NASA launch photos and beautiful ballpark panoramas. You can purchase the photos on his site. If you enjoy seeing Ben’s photos here as much as I do, support his work by going to his site and making a purchase. What could be more appropriate for the last season that the Mets will play at Shea than having rotating panoramic photos of the stadium? Click here to register for a random drawing for ticket purchase for Opening Day, Subway Series, and the last game at Shea. Registration ends on Monday 2/18/08 at 11:59pm.